THE NEXT time you visit the hill top shrine of Lord Venkateshwara at Tirumala, you can be sure of getting a better quality or tastier laddu - the lord's prasad. 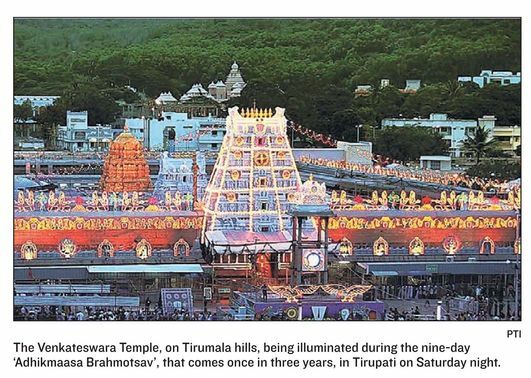 The Tirumala Tirupathi Devasthanam (TTD) has installed a conveyor lift to carry the laddus from the kitchen where it is cooked to the sales counters outside the temple, in the same pristine condition without any human touch on the way. The conveyor lift costing Rs 1.5 crore will now obviate the need of manually sorting the laddus into steel trays and then getting them carried by loaders, who have to negotiate through the surging crowds entering the temple to reach the counters located near the maha dwaram (main door). "The lift will save us a lot of space as there would be no need to keep so many vessels and trays to carry the same. The space will be used more efficiently. In the process we can make more laddus keeping in with increasing the demand. Besides it will now reduce the crowd at main entrance and make it easy for pilgrims to enter the temple," TTD Chairman Karunakar Reddy told the Hindustan Times. He said the laddus usually lost its shape and size, as well some flavour, because of human handling at different stages of transportation. Now it will retain the pristine quality. TTD produces around 1.40 lakh laddus on a normal day, which is stepped up to 3 lakh and more in festival times like the Brahmostavam. The conveyer lift will take the burden off 24 staff members, including 20 tray loaders. TTD plans to use their services productively elsewhere.